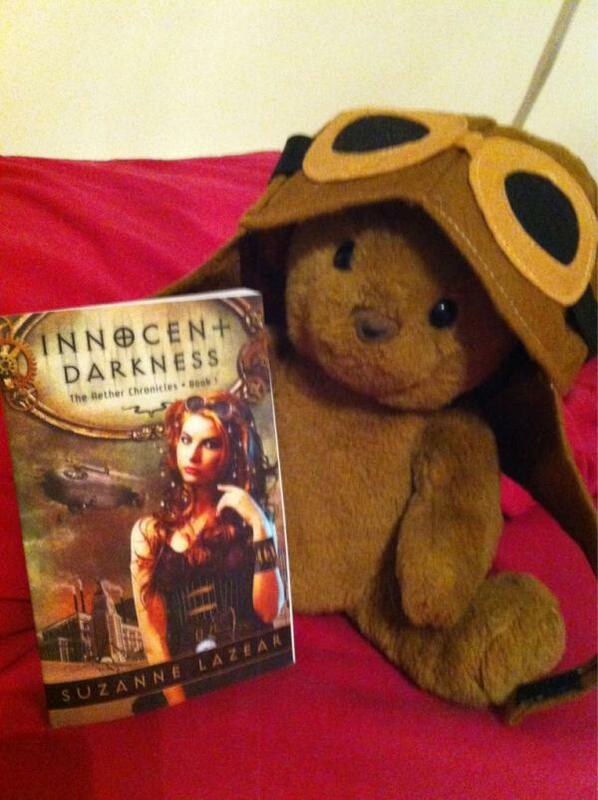 When I wrote INNOCENT DARKNESS I wanted to create my own fairytale, not Steampunk an existing one. So, I built my own. I took a few classic fairytale elements, ones we find in many, many classic fairytales such as wishes gone wrong, bad bargains, huntsman, and evil queens. I added in faery lore, which is different from fiarytales. This is the lore of the faeries (I used mostly Irish faery lore). Things such as never thank a faery. Oaks are often faery trees. The types of flowers faeries like. Never eat faery food. Then, I blended in Steampunk. Flying cars. Hoverboards. Air ships. Air pirates. I also added a dash of litterary references and quite a bit of research on the Victorian era. In this world I added my characters — Noli Braddock, James and Steven “V” Darrow, Queen Tiana, Kevighn. Then, I braided everything together to create INNOCENT DARKNESS and the upcoming sequel CHARMED VENGEANCE. 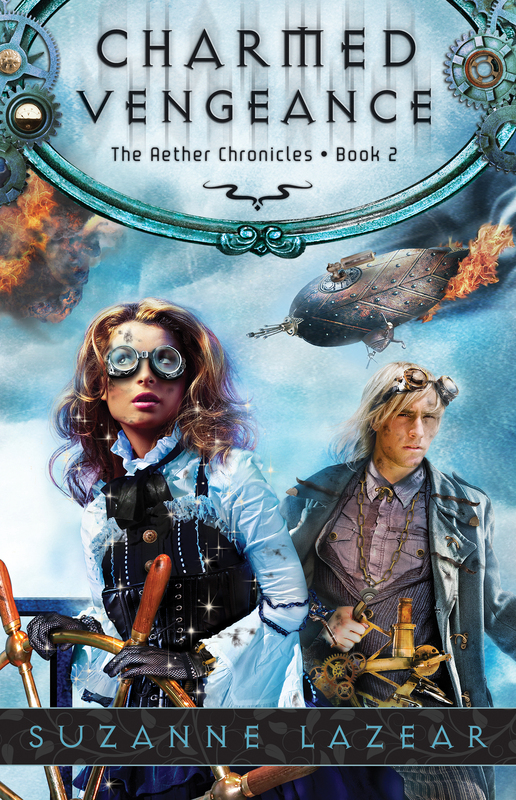 Here’s a quick video I made on how I combined fairytale elements with faery lore and steampunk to form the world of the Aether Chronicles book. (Mostly, it’s on the fairytale parts). 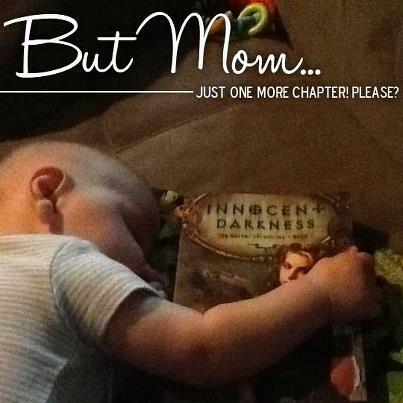 I’m having a read-along of INNOCENT DARKNESS to help you get ready for CHARMED VENGEANCE’s release. There are lots of prizes. Since CHARMED VENGEANCE releases 8-8-13, I’ve been trying to make more (awkward) videos. Here’s me talking about INNOCENT DARKNESS. Also, there are copies of CHARMED VENGEANCE up for grabs on Goodreads. You should enter. Happy Christmas Eve. Here’s a special winter story I wrote about V, Noli, and James. Author’s note: This takes place the December before INNOCENT DARKNESS. Noli frowned as she dusted the parlor, which looked…tired no matter how much she cleaned, fluffed or polished. Christmas decorations! That was what the house needed. Perhaps this year they weren’t having a house full of guests or going to Grandfather Montgomery’s in Boston, but that didn’t mean they couldn’t be festive. Too bad her older brother Jeffrey wasn’t here to share it with them. Father. A lump formed in her throat. Father had loved Christmas, getting down the decorations and putting them up himself instead of letting the servants do it. They’d even drive into the mountains to collect greenery and cut down a Christmas tree. The day would finish with a stop to play in the snow, building snowmen, and having snowball fights and a picnic with hot coco. Yes, greenery. That would be perfect—and they’d need a tree, since many of the decorations were ornaments. Mama hadn’t mentioned a tree, but this was a busy time for her dress shop, making dresses for all the holiday balls and parties. Dusting the picture on the wall of her father, she frowned. How would she get greenery? That could be another reason why her mother hadn’t mentioned it. The bit of money Noli had been saving was for a present for her mother and a proper—if tiny—Christmas dinner. This year she didn’t even have a present for her best friend V, other than a rose she was growing for him in the tiny greenhouse her father had built her long ago before he’d disappeared. A plan formed in her mind. V’s father was still out of town and her mother was working in the dress shop until dark. Yes. It was time for a snow day. She went upstairs and changed into her warmest clothes—flannel petticoats, a red wool day dress, winter boots, and a matching red cape and bonnet. They were getting snug; she’d grown since last winter. In the rag-bag downstairs, she found an old scarf. In it she wrapped some large buttons from her mother’s sewing box and a carrot, and put it in a basket along with some rope and a burlap sack. There wasn’t much in the cupboards for a picnic—some jam sandwiches and apples. They didn’t even have the makings for hot coco, but perhaps V did. On the kitchen table she left a scribbled note for her mother that she was with V. Going out into her backyard, she added her goggles and aviator’s cap to her basket. If they were taking V’s father’s auto they she’d need that. Opening her father’s battered toolbox, which she kept hidden in the back shed, she took out two small handsaws and put them in the basket as well. They’d need them to cut down the greenery and tree. Noli climbed through the loose board in the fence and knocked on the back door. When no one answered, she cracked open the door. Good, they were home. “V? V are you home?” she called. There was a patter of feet and Elise, V’s little sister looked up at her with big blue eyes, blonde hair in ringlets. “Hi, Elise, is V home?” Noli came all the way into the Darrow’s warm kitchen. Her nose twitched. Someone had been baking, either the housekeeper who came during the day to cook and clean or Quinn, the Darrow children’s live-in tutor. “Yes, he’s upstairs.” Elise looked Noli up and down. “Are you going on an adventure? May I go? Please? You never let me go.” Her lower lip jutted out in a pout. Crumbs covered the white pinafore of her pink ruffled dress. No. Her going with them wasn’t an option. Their adventures often wound up with them getting in trouble. Mr. Darrow would be quite cross if their mischief caused any harm to little Elise. Her father had helped her and V build a tree house in her backyard. 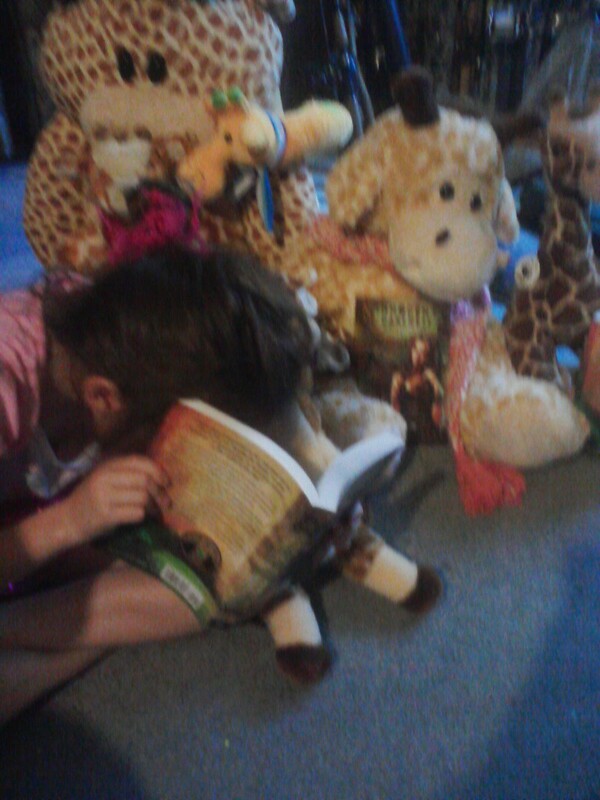 She and V used it, though now for studying and inventing than playing. So that’s what smelled so good—and covered Elise’s dress. “Yes, that sounds perfect. I’ll go find V,” she replied. He was probably studying. Just like she’d thought, Noli found her best friend, Steven Darrow, hunched over his desk in his bedroom, reading some archaic tome. His idea of a good time. “Hi, V, let’s go on an adventure.” Noli leaned against the door. Where she liked books, on a beautiful Los Angeles December day they needed to be outdoors having fun, not reading. “Don’t be a fussy old bodger. It’s Saturday. Please? I can’t do this without you. I need you to drive,” she pleaded. V was a year older than her and possessed an operator’s license. Where she was an ace driver, not only did she not hold an operator’s license, or even a permit, she’d been expressly forbidden from driving Mr. Darrow’s auto. “Where are we going?” He closed his book and stood. The roofless red and gold enameled steam-powered auto sitting in front of the Darrow residence was a few years old, but top of the line. V started up the engine and climbed in, little puffs of smoke curling from the hood. Noli pulled out her aviators cap and some goggles from the picnic basket on her lap. She stuffed her wild chestnut curls into the cap so they wouldn’t get unruly on their drive. 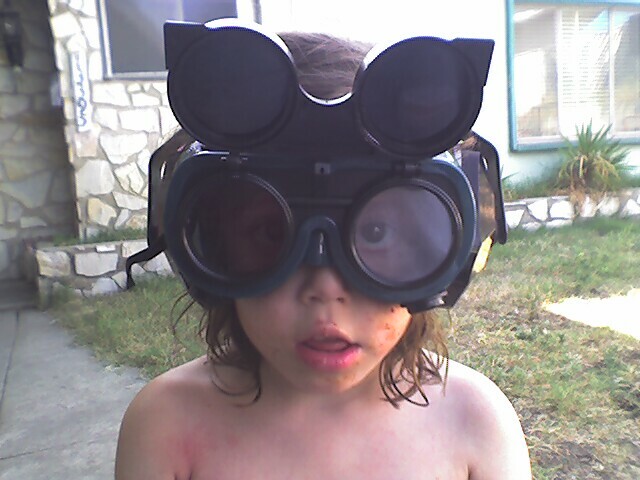 One set of brass goggles went over her head to keep the bugs from flying into her eyes, the other she handed to V.
“Thanks.” He pulled them on over his spectacles, which made for a comical effect. “Wait for me!” James came running out the front door, a muffler and wooly gloves in his hand. The knit cap on his head clashed with his winter coat. “No.” She shook her head. “He has to sit in the back, though.” James, V’s brother, was about a year younger than her and often accompanied them on their adventures. James hopped into the back and they took off. “We’re going to the mountains—you can’t bring back a Christmas tree on a hoverboard,” Noli replied. Hoverboard were tiny things, you couldn’t even carry two people without becoming unbalanced. They made the drive into the mountains, which James made annoying by serenading them with dirty versions of holiday carols. “Where? All I see is Noli?” James grinned. Quinn had graciously added cookies, coco, and a number of other delicious things to their basket. Finally, they arrived at their destination. It was hard to believe they were in California and not back east, everything white with a fresh dusting of snow, making it look like confection sugar had been sprinkled over the landscape. If only the trees were made of colored marzipan. Her stomach rumbled at the thought. Holding out her arms and spinning around in the snow, she tilted her head toward the sky and breathed in the scent of pine. A snowball hit her in the face, smearing everything not covered by her goggles with icy wetness. “James Darrow, I’ll get you for that.” Noli formed a snowball and threw it at James, who ducked behind the auto, causing it to hit a tree instead. She glanced at V, who nodded and pointed to a small arsenal of snowballs he’d already made. “Sure,” he replied. As soon as James emerged from his hiding spot, she and V pelted him with snowballs, one after the other. James didn’t give up easily and soon all three of them were covered in snow, laughing so hard their sides hurt. “Help me.” Noli rolled a ball of snow for the base of the snowman. James and V helped and soon they had a small snowman with branches for arms, button eyes, a carrot nose, V’s red muffler, and James rather ugly kitted cap. Taking the hat off the snowman, she put it back atop James’ dark blonde curls. She had to stand on her tiptoes, since even though he was younger, he stood taller than V.
“Hey, Noli.” James threw a snowball at her. Noli fell backward into the snow to miss it and made a snow angel, moving her arms and legs to make the wings and dress. “I don’t see why that’s a problem?” Already her kidskin gloves were soaked from their fight, but who cared? It’s not as if they got to see snow often. They sat down to their picnic. Since they hadn’t packed any cups or plates so they used their fingers and handkerchiefs and passed around the thermos of hot coco, which was now lukewarm, but tasty nevertheless. “We have a tree,” James shrugged. James took one saw and the bag and went into the trees to find greenery. She and V set off to find a tree. “This one,” Noli called as she stood in front of a majestic pine. “What about this? Driving with this one tied to the auto will be challenge enough. Father’s auto was meant for show, not carrying things.” The pine V gestured to was much smaller, about as tall as Noli, but just as full and green as the other. The cut down the tree, which took some work with such a small saw, carried it to the car, and tied it to the auto. “I can drive,” she offered again. He was such a fussy old bodger sometimes. “That’s all right. I’m going to make sure all the knots are tight. The last thing I want is for it to fall off while we’re driving. Why don’t you find James?” V bent over to check the knots. A kissing bough was a sphere made of wire and greenery, festooned with ribbons, and hung with nuts, apples, and oranges. Ribbons attached mistletoe just below the sphere and the entire thing was hung from the ceiling. If you were caught standing under it, anyone could kiss you as forfeit. Plenty of ladies—and men—tried to use it as a means to steal a kiss from someone they fancied. Given her family’s status as “fallen gentry” she had no suitors. Not that she cared. Her plan was to go to the university and become a botanist. Besides, other than V and James, society boys were boring. “And why would I do that?” It wasn’t that she was adverse to the idea of kissing V, but he had other girls to kiss—ones with money, beautiful gowns, and fine manners. Mr. Darrow might tolerate them being friends, but he’d never permit them to court. Not that V was interested in courting anyone. They loaded the sack into the car, took their things off their snowman, and drove back to Los Angeles, James singing more dirty carols. It was dark by the time they pulled in front of her house. Even in the dark it looked more worn than the other houses. The windows were dark, but that didn’t mean someone wasn’t home. It was too expensive to run the gas lamps much. V got out of the car. “My apologies for getting us home so late, Mrs. Braddock. May I carry this into your parlor?” He gestured to the tree tied to the back of the car. “I’d love to. Oh, your father…” Her eyes grew misty. “I know, Mama, I know.” Just the thought made her wish he were here. Now he could wage a snowball war like nobody’s business. Noli put her goggles atop her cap, and grabbed the picnic basket out of the auto. They all headed up the steps. Her mother carried the basket, she carried the sack, and James and V followed, carrying the tree. “I’m afraid I don’t have anything to make hot coco, but Quinn just brought over a lovely pie. Shall I brew some tea and we can have tea and pie and decorate and listen to carols?” Mama’s face suddenly seemed less tired. What had been a fun day just became perfect. 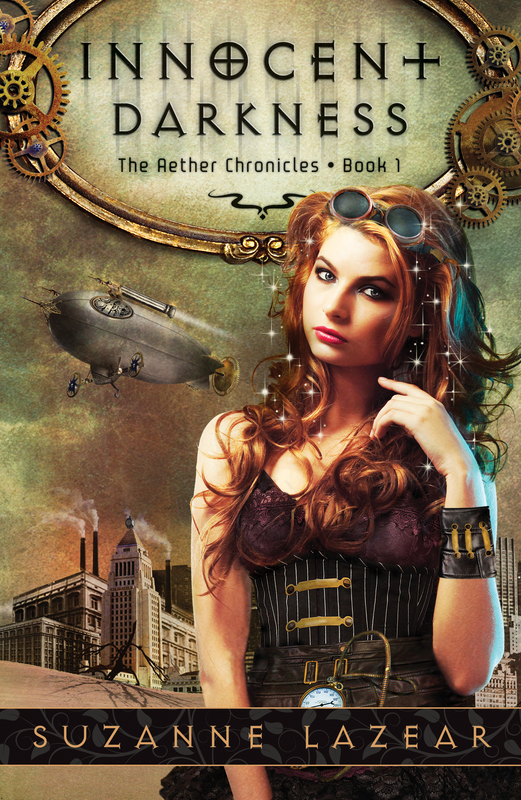 Suzanne Lazear is author of the Aether Chronicles series, YA fairytale steampunk. INNOCENT DARKNESS, book 1, is out now from Flux. CHARMED VENGEANCE, book 2, will be out in 2013. So…it’s here. 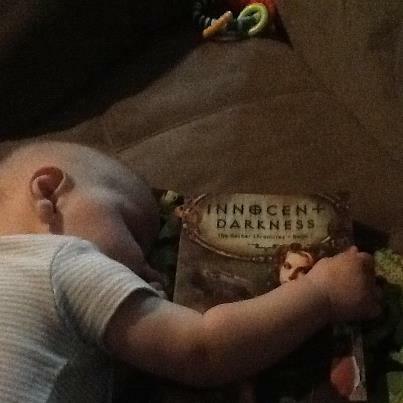 My fairytale steampunk young adult novel INNOCENT DARKNESS hits shelves Wednesday. Then it will be officially “in the wild” which is exciting and terrifying all at the same time. So…who wants to win some prizes? You know, like these? 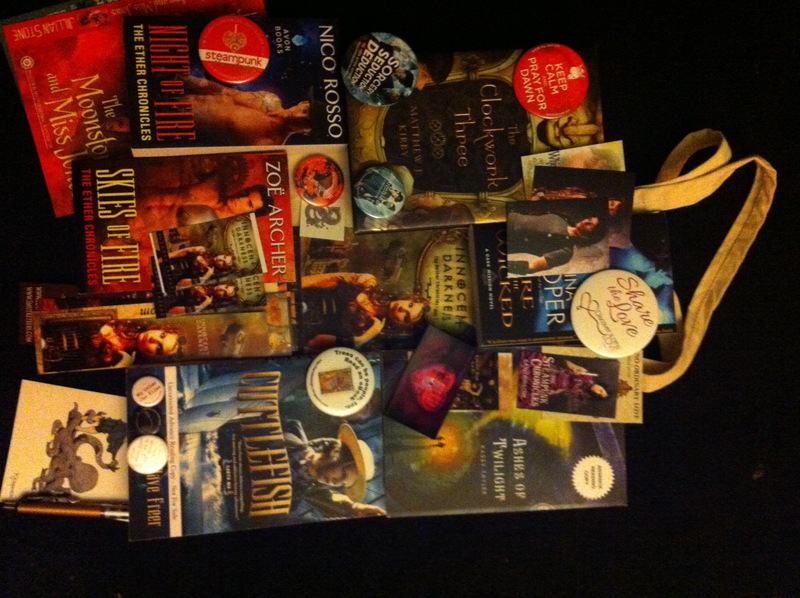 So one grand prize winner will win a fifteen dollar GC to Amazon, B&N OR the Book Depository + Zoe Archer’s SKIES OF FIRE and Nico Rosso’s NIGHT OF FIRE (both from the Ether chronicle series, because series that have “eather” or “aether” in them are awesome) + some buttons & swag in an INNOCENT DARKNESS tote bag.